The quiet drama of a midnight ocean, moonlight sparkling on the gently rolling waves, is reflected in this necklace. 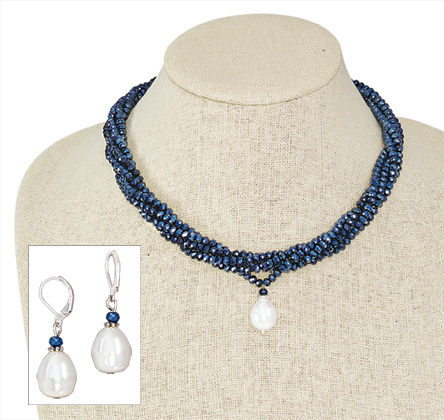 Multiple strands of deep blue crystals sparkle with each subtle movement, while suspended at the center, a dramatic luminous freshwater pearl glows. 17" long; strong magnetic clasp. Sold as a set with coordinating latchback drop earrings.